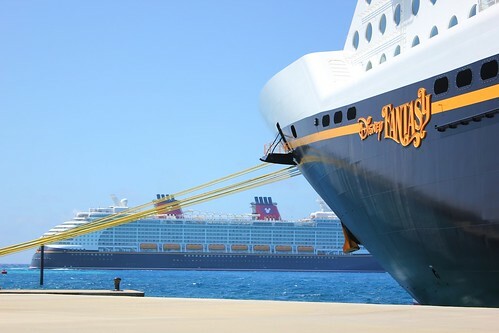 The Disney Fantasy today completed her Inaugural cruise out of Port Canaveral, Fla. with a few surprises at sea that helped to welcome the new ship to Disney Cruise Line. 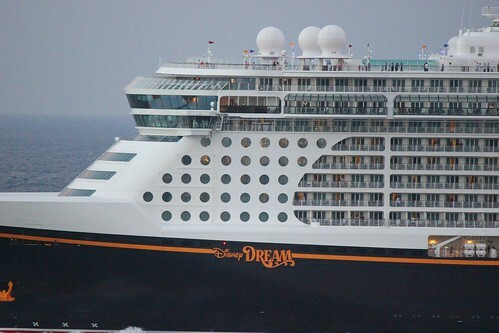 During the 3-day voyage, March 23-26, 2012, sister ship Disney Dream sailed by not once, not twice, but three times, a first-time event that likely isn’t to be seen again any time soon. 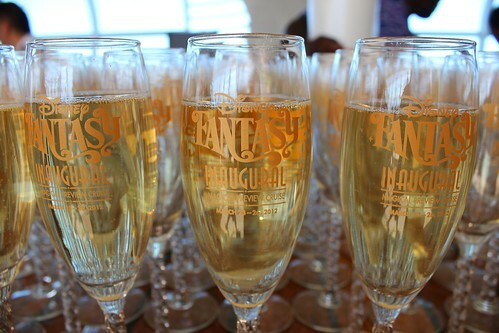 The Dream’s first arrival was marked by a surprise announcement aboard the Disney Fantasy at around 9:00 p.m. on March 24, 2012, letting all aboard know that at 10:30 p.m., the two ships would be passing in the night. 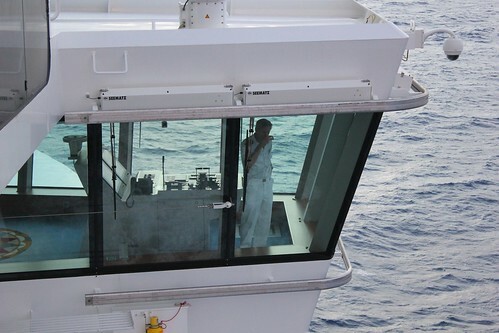 Excited passengers crowded both ships’ top decks and balconies to catch a glimpse of the rare sight. Then came the second surprise of the night: Dueling fireworks were on the way. It was Pirates in the Caribbean night aboard both ships and the Disney Dream shot off her Buccaneer Blast show first, an incredible sight on board made even better by enabling Fantasy guests to watch from afar, in the middle of the ocean. The event even took Disney a bit by surprise, with one of their marketing camera crews rushing to the top deck and asking guests to part ways to allow them to capture the moment. 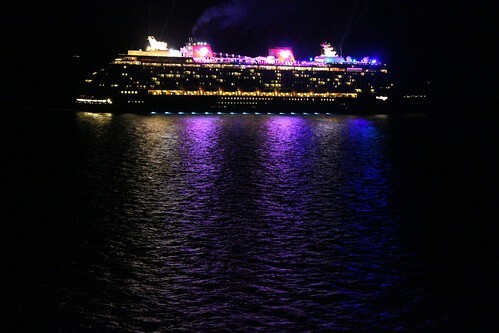 Shortly after the Dream finished her fireworks show, the Fantasy launched the same show, offering Dream passengers and equally amazing sight. The two ships then sailed in opposite directions as the Fantasy sounded her horn in a variety of Disney tunes. All on board hoped for a horn battle, but the Dream never answered – at least, not this time. 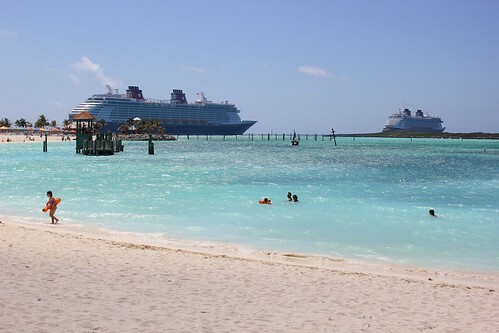 What guests aboard both ships didn’t know was that the following day, March 25, 2012, the Dream and Fantasy would meet again at Castaway Cay. 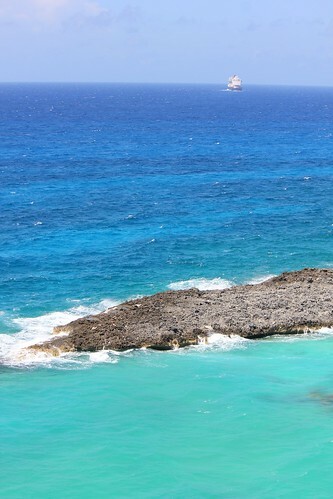 I was standing on Serenity Bay (above) when I spotted a Disney Cruise Line ship pulling into the island. At first I thought it was the Fantasy parked there, which I had just gotten off of, but then I realized the ship I was looking at was moving and unless it was leaving me behind, it couldn’t have been the Fantasy. Immediately hopping a tram back to the ship, I captured a great view of both ships just off the coast of Disney’s private island. 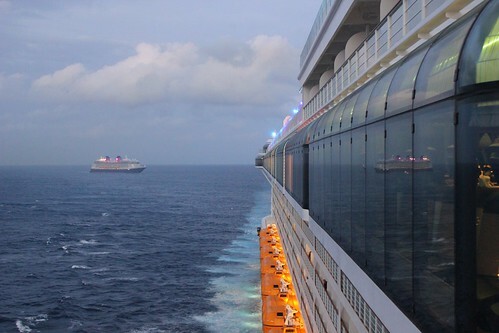 The Dream sailed away again, and guests on board thought that was the last time the two sister ships would meet. But another surprise encounter awaited as after departing Castaway Cay, the Fantasy caught up to the Dream and pulled along side her as the sun working its way down the sky. 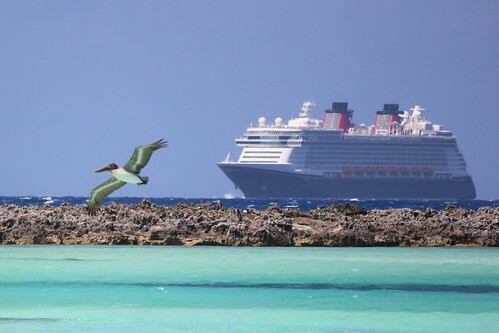 That was the last time the new Disney Dream and newer Disney Fantasy met during this Inaugural preview cruise and it’s not an event that will happen often. 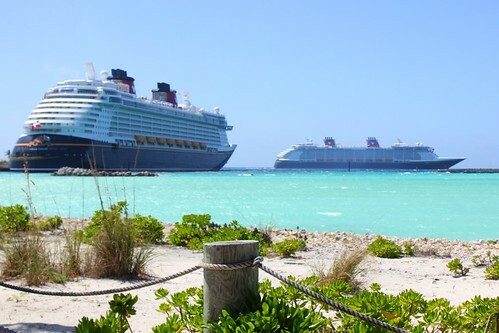 The two ships sail different itineraries in the Caribbean and won’t dock at the same port at the same time. But those on board either vessel during this special voyage were offered a unique treat that only Disney Cruise Line could provide. 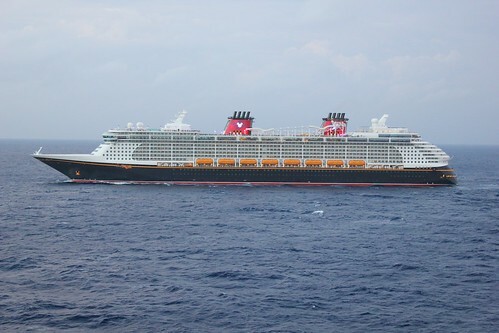 The Disney Fantasy will have her maiden voyage on March 31, 2012. Much, much more from the new Disney Fantasy will be coming in the next few days, perhaps even weeks, including complete coverage of everything that’s unique to the newest ship in the Disney Cruise Line fleet. So keep checking back to Inside the Magic to see it all! what a fun company to be working for. Congratulations Randy on nearly 14 years with the Mouse!!! Ricky, here is some more information about this story. We were on the Dream for its 5 day cruise. 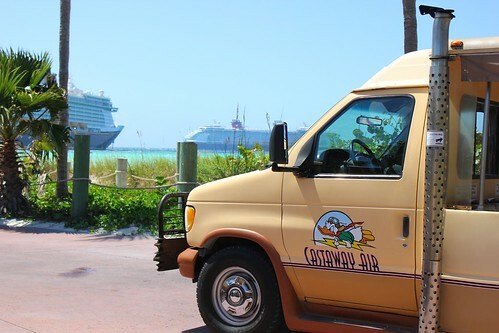 Captain Guus also informed us at the same time that we would be making a ‘drive by’ of Castaway Cay on Sunday. It was a beautiful sight seeing the Fantasy in dock at CC, again tons of crew members were trying to get pictures of themselves and the Fantasy together. It really made the atmosphere electric with excitement. Then about 3pm on Sunday Captain Guus informed the Dream about the Fantasy overtaking the Dream about 7:20pm that night. Captain Guus called the event the “Triple Crown” event. The horn battle was fun to experience from deck 12 port side. 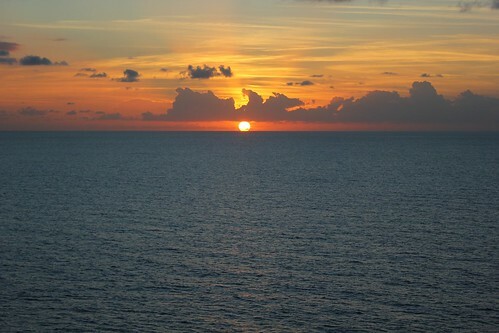 And then one more thing happened, Monday evening around 11pm or so as the Dream was heading to Cape Canaveral, from our verandah, I saw the Fantasy cruising past us heading towards Freeport Bahamas on her next cruise. A 4-peat! 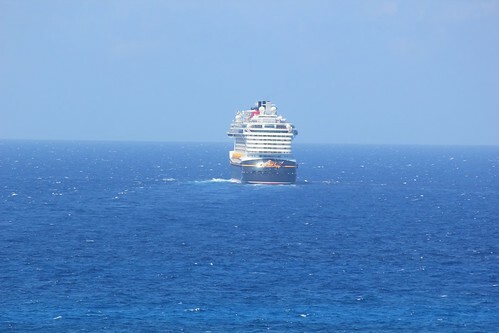 What a memorial cruise it was, so much Disney Geekness by everyone on the Disney Dream! I would have loved to have been there during that magical moment that only Disney can provide. These are the most beautiful ships in the world!! !